NEWS............................... 4 Merger bill poses changes for EV school districts. BUSINESS . ................ 17 Mesa snack company runs contest. Mesa’s Mountain View High baseball team is red hot. GET OUT.................... 26 Mesa comedian makes laughs for charity. was placed on administrative leave by the new board in January shortly after the election. The agreement would appear to relieve EVIT and taxpayers from the burden created by the third year of Downey’s contract extension, which was to run through 2021. The politically well-connected Downey has many fans who have come to her defense, including former Mesa Public Schools governing board president Ben Smith and longtime EVIT supporter Shon Rasmussen. But her impending departure was cheered by those attending the meeting. They broke into applause after the board met in executive session to confer with an attorney before approving the separation agreement. Please call us at (480) 835-7892 to make an appointment. This is a limited time event and appointments will fill up fast! We will be offering the following services FREE of charge during this limited time event: 1. FREE Hearing Evaluation* to determine if you have a hearing loss. 2. FREE Video Otoscope Exam* to see inside your ear canal - your hearing loss could just be wax build-up! 3. FREE Product Demonstration of the NEW NOW™ iQ Rechargeable hearing instruments from NuEar®, the longest lasting rechargeable hearing aids available today! 4. FREE Clean and Check. If you currently wear hearing aids we will adjust, clean and fine tune them at no charge during your appointment. on any new digital hearing instrument from NuEar® Limit one coupon per customer. Not valid with any other offers. Expires 4/18/19. 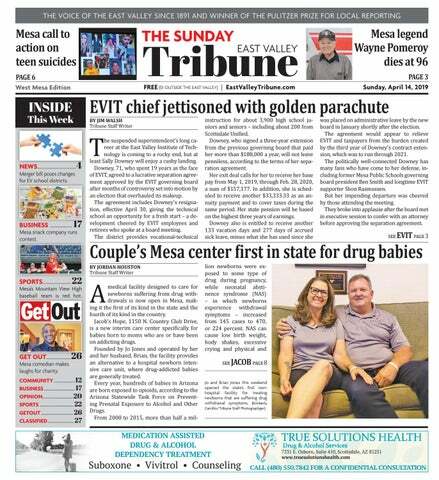 The East Valley Tribune is published every Sunday and distributed free of charge to homes and in single-copy locations throughout the East Valley. To find out where you can pick up a free copy of the Tribune, please visit www.EastValleyTribune.com. Publisher: Steve T. Strickbine Vice President: Michael Hiatt ADVERTISING DEPARTMENT Senior Account Sales: Ryan Brown | 480-898-6482 | rbrown@timespublications.com Local Advertising Sales: Chris Ross | 480-898-5649 | cross@timespublications.com Woody Rogers | 480-898-5622 | wrogers@timespublications.com Classifieds/Inside Sales: Elaine Cota | 480-898-7926 | ecota@evtrib.com TJ Higgins | 480-898-5902 | tjhiggins@evtrib.com Advertising Office Manager: Lori Dionisio | 480-898-6309 | ldionisio@evtrib.com Director of National Advertising: Zac Reynolds | 480-898-5603 | zac@evtrib.com NEWS DEPARTMENT Executive Editor: Paul Maryniak | 480-898-5647 | pmaryniak@timespublications.com Reporters: Wayne Schutsky| 480-898-6533 | wschutsky@timespublications.com Jim Walsh | 480-898-5639 | jwalsh@timespublications.com Jordan Houston | 480-898-7915 | jhouston@timespublications.com Kayla Rudlege |480-898-56 | krudledge@timespublications.com Sports Editor: Zach Alvira | 480-898-5630 zalvira@timespublications.com Get Out Editor: Christina Fuoco-Karasinski | 480-641-4518 christina@timespublications.com Photographer: Kimberly Carrillo | kcarillo@timespublications.com Pablo Robles |Probles@timespublications.com Designer: Ruth Carlton | rcarlton@timespublications.com  Production Coordinator: Courtney Oldham | 480-898-5617 production@timespublications.com Circulation Director: Aaron Kolodny | 480-898-5641 | customercare@evtrib.com East Valley Tribune is distributed by AZ Integrated Media, a circulation service company owned by Times Media Group. The public is permitted one copy per reader. For further information regarding the circulation of this publication or others in the Times Media Group family of publications, and for subscription information, please contact AZ Integrated Media at circ@azintegratedmedia.com or 480-898-5641. For circulation services please contact Aaron Kolodny at aaron@azintegatedmedia.com. The content of any advertisements are the sole responsibility of the advertiser. The Tribune assumes no responsibility for the claims of any advertisement. © 2017 Strickbine Publishing, Inc.
Another separation agreement for Assistant Superintendent Steve Waldvogel was discussed in executive session. The board voted to authorize attorneys to follow the advice that was discussed in private, but a final agreement has not been reached. “I feel a real shift in the energy. It is a positive change,” said Kelley Grantham, a 3D animation teacher. “The atmosphere is more collaborative.” “Even me being able to speak to you is unheard of and this is new to EVIT,” she said. Kim Foulger, an interior design and fashion teacher, said that she and other teachers feel liberated by Downey’s departure. “There was a lot of fear for your job if you stepped out of line,” Foulger said. “There’s been a lot of ongoing suppression of teachers. There wasn’t a lot of freedom.” Foulger thanked the new board, which has been criticized by Downey’s allies. “Thank you for endeavoring to create a new culture of liberation at EVIT,” Foulger said. “It is 2019 and time for a positive change at EVIT.” Foulger said the atmosphere created by Downey revolved around fear and retaliation. She said one example was Downey’s insistence that EVIT remain open during the Red for Ed movement last year and her refusal to allow teachers to participate. University to earn bachelor’s and master’s degrees in business. In some ways, his civic activism seems to have picked up a notch around 1971 when his beloved horse Snuffles died. “He loved horses and he loved that horse,” his daughter recalled. And through all his community service and business involvement, his family always came first, Fluhr said. “He was literally the most amazing dad,” said Fluhr, who could not single out one moment she will always remember with him “because there are so many.” “We spent a lot of family time together,” she said. “I am not sure how he was able to attend all my and my sisters’ activities but he did.” Mr. Pomeroy was preceded in death by his wife Cecil, his son-in-law Harvey Wood and his grandson Clint Fluhr. He is survived by daughters Cassandra Wood, Wendy (Phil) Hildebrand, Michel (Chris) Fluhr and Lisa (Brett) Bargery, 11 grandchildren and 17 great-grandchildren. A viewing will be held 6-8 p.m. Wednesday, April 17, at Bunkers Garden Chapel, 33 N. Centennial Way, Mesa. Funeral services Thursday, April 18, at 11 a.m. at the Church of Jesus Christ of Latter Day Saints, Mesa 5th Ward, 1718 N. Date, Mesa. A viewing will be held one hour before services begin. Interment will be at the City of Mesa Cemetery. In lieu of flowers, donations can be made to Hospice of the Valley, 1510 E. Flower St, Phoenix, 85014; Save the Family Foundation, 125 E. University Drive, Mesa 85201; or A New Leaf, 868 E. University Drive, Mesa 85203.
quired by law to maintain an administrative infrastructure that is as costly as some districts with more schools. “To some degree, consolidation needs to happen,” King said. “For a school district like ours – with the number of students we have – it doesn’t make sense. It would be disastrous.” During the Senate hearing, Bowie noted that Arizona’s per pupil administrative costs were well below the national average of about $1,300. The latest Arizona Auditor General’s report on school per-pupil spending said the statewide average per pupil cost of administration is $860. The per-pupil administrative cost in Higley is $875 and $845 in Queen Creek. Efforts to force consolidation have been discussed for more than a decade. In 2001, a Senate panel approved a measure creating an independent commission to consolidate the more than 200 school districts in the state to no more than 90. Those that refused would be denied state aid. It died after drawing fire from officials from some smaller districts, who argued with the presumption that small is bad and wasteful. Five years later, a special School District Redistricting Commission created by the legislature proposed at least forcing a vote in each district on consolidation. But that failed to produce the desired results. Call Dr. Hiatt at 480-844-1410 to schedule your appointment! Helping our residents find opportunities to thrive and live with purpose is part of our culture. Independent Living resident, Simone, volunteers to care for our roses—both are thriving! Spring into a New Lifestyle The freedom to pursue the life you want, and freedom from the things you don’t. 35 West Brown Road, Mesa, AZ 85201 • FellowshipSquareSeniorLiving.org *Valid only at Historic Mesa Community. Meal offer valid for first time visitors only. Other restrictions may apply. Expires May 31, 2019.
what it’s like creating an entity “ Imagine in the state that doesn’t exist. There’s no map. There is no list, there is no blueprint. There is nobody out there to tell you this is what we did. That’s what this team for Jacob’s Hope has done. When Jacob approached his teens, he started exhibiting behavioral and emotional problems. “When he turned 15, it was like everything just hit. He started having emotional issues and we were taking him to doctors and counselors and psychiatrists,” said Jo. “He had a volatile temper, it would just build up and then he would kind of explode. It wound up being difficult.” At some point, Jacob was introduced to drugs and alcohol, beginning a lifelong battle with addiction. He went on to serve in the military for four years before he died at the age of 25 after consuming a bad batch of cocaine. Devastated by her son’s death, Jo found solace in a book that changed her life – Barbara Drennen’s “Caring for Drug-Exposed Infants.” The book details the crippling side effects drug-exposed newborns face and highlights the author’s original care facility, the Pediatric Interim Care Center in Washington – which soon became the model for Jacob’s Hope. It was in this moment that Jo realized her son met the criteria of those newborns. With Barbara’s work as her inspiration, Jacob’s Hope was born about a year and a half later. But the road to success wasn’t easy. The two parents quickly realized the difficulties of starting a nonprofit, especially one that has never existed in the state of Arizona before. “We have had countless situations where a door was closed and God was out there saying, ‘Just keep going, keep going because this is going to happen,’” said Brian, adding: “Imagine what it’s like creating an entity in the state that doesn’t exist. There’s no map. There is no list, there is no blueprint. There is nobody out there to tell you this is what we did. That’s what this team for Jacob’s Hope has done.” After two and a half years of renovating, retrofitting, inspection and licensing reviews, Jacob’s Hope finally secured a license from the Arizona Department of Health Services. The final step of gaining its Arizona Health Care Cost Containment System insurance provider information is in the works and will be completed soon. Both Brian and Jo attribute the facility’s success to its dedicated team as well as donations from supporters across the state. They estimate they have received up to $160,000 in donations and products so far. While the facility only caters to newborns at the moment, Brian expressed that there is a possibility it could expand to caring for the mothers down the road. The facility is in its beginning stages of opening and expects to have its first patients by May. – books and other reading materials will feature storylines and characters that reflect different cultures. T h e changes will be im- Chandler schools’ equity director Adama Sallu said students must see plemented their culture reflected in curricula. next school (Tribune file photo) year, but training has already begun with teachers to jump start inclusion in the classroom. Through educational seminars and training sessions, Sallu said, teachers are learning about equity to “engage in educating the demographic landscape in our schools.” She said that classroom equity is the responsibility of both teachers and students. “Equity is really about raising the bar for kids, holding the kids accountable for learning, demanding excellence not for some of our kids, for all of them. Every day, every child, every school,” Sallu said. “There is a lot of information out there about the work of inclusion and equity and some folks think it is against a group of children, but it is about demanding excellence from all children and ensuring they get what they need,” she added. Though much is being done in the classroom to create employees of the future who can relate to coworkers of different races and cultures, Sallu said there are still many challenges to creating equity in the classroom – many of which have nothing to do with the classroom at all. “Some of the problems we have in our school are poverty, lack of healthcare, families who are homeless, children who are hungry. These are issues that are more societal, but it affects the kids in school,” Sallu said. “If a child is having emotional issues outside of class, they cannot learn, so our teachers must extend grace. These kids are going to come to our public schools and as they come, we must love them, we must see them, we must honor them,” she added. The next diversity and inclusion meeting is set to be held June 26, where the panel will reconvene to further discuss what is being done in the East Valley to create an inclusive workforce. Retirement Living Worth the Wait. Visit Our Information Center. Now Open! Scheduled to open later in 2019 at the corner of Riggs Road and Gilbert Road, Clarendale of Chandler will offer a continuum of care under a simple monthly rental program. Discover apartments and villas for independent living, as well as residences for assisted living and memory care, in a beautiful community where residents stay connected to the people and places they love most. Meet the Clarendale team. Hear about our Navigation Program. Learn about our Founder’s Club. Find a floor plan that is perfect for you! ment of Educational Readiness to Inform Teaching. One particular difference is that it was not linked to high school graduation. The following year Arizona lawmakers agreed to be the first in the nation to allow schools choose from a “menu” of standardized tests for high schools. Based on that, the state Board of Education came up with a list of permitted options. That includes the SAT and ACT. This is the first year that the substitute tests were allowed, and Chandler Unified School District took full advantage of administering the ACT to the district’s juniors. “Our biggest thing with going with the ACT and going with the menu of assessments was we were able to eliminate six days of testing at the high school level and put those days back into the classroom because the ACT is one day,” said CUSD Assistant Superintendent Wendy Nance. Nance added another advantage to ACT is that it is a college-readiness test that helps students gauge if they are prepared to continue their education after high school. CUSD public information officer Terry Locke also noted that student absenteeism is lower during ACT testing than during the 6-day AzMERIT test period. original goals of allowing alternatives to AzMERIT by eliminating that test in Grades 10 and 11. Hoffman and Narducci said that schools remain free to choose assessments from that alternate menu. But they said it has to be in addition to the AzMERIT test. And they said it is “undecided” whether the state will pay to administer any other test. What makes Brogan’s denial crucial is that he is threatening to place Arizona’s Title I grants into “high risk” status. It is that which endangers the $340 million the state gets in that type of federal aid this year. Swiat said plans are underway to prevent that from happening and that the state board will meet later this month to decide what to do next. But Swiat conceded that his agency had not provided to federal officials the information they said they needed to approve an alternative to the AzMERIT test before schools were given the go-ahead to start offering those options. He said, though, that both the state Department of Education and the Board of Education were instead counting on Arizona getting the waiver from having to provide all that – the waiver that was just denied. Principal Chip Pettit won in Gilbert Public Schools. Tempe El winners were Ward Traditional Academy, Taime Bengochea; and Arredondo Elementary, Alison Bruening-Hamati. The evaluation process for the award includes a lengthy written application and a rigorous site visit conducted by a team of trained judges and documentation across a variety of categories, from parent and community involvement to programs and practices. Schools receive $500 and a banner designating for the award, which is valid for three and a half years. “Recognition through the A+ School of Excellence™ program can help increase confidence in Arizona’s public schools and create greater parent and community support,” the foundation noted. NO CONTRACTS NO START-UP FEE • Medical Consultation • B12 Shot • Appetite suppressants • Supplements to Curb Cravings & Boost Metabolism • Meal Plan • Weekly Weigh-Ins • And More! Meet the minds behind the ACOYA Mesa vision! Ask questions and pick the brains of the ACOYA team and learn our story. Please RSVP by 4/20. RSVP OR LEARN MORE BY CALLING (480) 498-7854 OR VISITING ACOYAMESA .COM SPACE IS LIMITED. A NOVEL APPROACH TO LIFESTYLE. ACOYA Mesa is changing the story of senior living. Our holistic approach to wellness means full access to care options plus a schedule of classes to feed your mind, exercise your body and energize your spirit. Schedule a visit today! when the First Lady of Arizona, Hattie Babbitt, celebrated our open house towards the end of that year,” she added. “We welcomed the first of thousands of babies and young children into our shelter around Thanksgiving of that year.” She said Mahnah members stayed involved year after year, volunteering hands-on in countless ways, assisting in capital drives for needed expansions and serving on committees and the board. Two members – Betty Kerr, now deceased, and Nancy Sheridan – served as board chairs. Scarpati said it was “only fitting” that the first wing of the larger 42-bed shelter was named Mannah Wing. “As the center added buildings and programs, they walked the walk with us,” she said. Torrie A. Taj is now CEO for Child Crisis Arizona. Said Nan Ater, board chair of Gabriel’s Angels executive committee: “It is wonderful to share our mission of inspiring confidence, compassion and best behaviors in at-risk children through pet therapy.” Ater said the nonprofit plans to use the money to support its 190 pet therapy teams. “These Pet Therapy teams deliver healing pet therapy to Arizona’s at-risk children, nurturing their emotional development and enhancing the quality of the lives forever at over 125 child serving agencies, and visit 15,200 children annually,” she said. WWC has groups around the US, Canada and worldwide; two WWC chapters are located in the Valley: WWC Phoenix and WWC Valley of the Sun. arlier this year, around 60 women, checks in hand, gathered at the Scottsdale Hilton Resort & Villas. For one hour, from 6:30 p.m. to 7:30 p.m., three women addressed the room, speaking about the charity of their choosing – a charity they hope will be on the receiving end of a multi-thousand-dollar check. That night, the group – 100+ Women Who Care (WWC) Valley of the Sun – chose Phoenix-based nonprofit Gabriel’s Angels. And on March 7, WWC Valley of the Sun Chief Community Builder Kim Tarnopolski and co-founder Jacqueline Destremps presented a check to Gabriel’s Angels for $9,050. ity via their website or other preferred method. It’s not necessarily $100 per person, either. The Valley of the Sun chapter allows teams, so the $100 can be split two, three, four different ways, depending on the size of the team. The final step of the quarterly giving circle is the executive committee collects all of the checks and gives the money to the charity within one month of the giving circle. In total, WWC Valley of the Sun has raised and donated $375,325 to 46 local charities. came before them. He now makes room to explore a plethora of subjects with students, including early Arizona tribes and the state’s most famous landmarks. “It’s a fun challenge and it’s fun to bring new ideas to their world, and the club and competition will allow them to portray and evaluate history in their point of view, which is always fun for me,” Carras said. Nominated alongside just 56 other teachers from the junior division, Carras’ designation for the award is a strong representation of his immense love for his students and his passion for learning something new every day. The national winner of the award is given $5,000, which Carras hopes to win in order to spread his love of learning to others in his family by sending his mother and sister to Ireland. “My [great grandmother] is from Ireland so [my mother] has always wanted to go and see the history and lifestyle there, and I just think it’d be so cool to send her there. She’s a teacher also, so she loves learning and being a lifelong learner,” Carras said. The national winners are set to be announced June 13. Hear from an expert and meet others living with SMA. Register today at LivingWithSMA.org or call 1-888-615-4343. We’ll resolve your debt as quickly as possible so you can finally start living the life you want. Check out your doctor before your checkup. We make it easy to find your new favorite doctor using online ratings, personal videos, and more. Your comfort is our top priority. That’s why we’re here to bring you and your family relief wherever we can. Find a world of support at bannerhealth.com. now, and we’re acquiring dirt right now to build more communities.” The petfriendly The Alan, w h i c h starts at A picnic area is on one end of The Alan’s property. (Photo courtesy $ 1 , 5 0 0 Porter Kyle) per month, is near The private balco- Hale Elementary, Stapley Junior High The kitchens, which lead into a living room, have granite countertops and stainlessnies off the master and Mountain View High schools. Starsteel appliances. (Photo courtesy Porter Kyle) bedrooms have ar- bucks and Dutch Bros. are nearby, as Shultz said. “It used to be an old orchard tificial grass to give it a homey feeling. are Sprouts and Fry’s Marketplace. The and we rezoned it with the city of Mesa.” The master bedrooms also have a picture gated community has a picnic area and a The units have two-car direct-access window for plenty of natural light. dog park on site as well. garages, and the homes’ interior has “It’s not your traditional apartment “There are a lot of tenants who moved 10-foot ceilings throughout. They boast building,” said Shultz, whose company in here just so their kids could stay in the stainless steel appliances, granite coun- transitioned into a multifamily developer school district or they sold their house tertops, full-size, front-loading washers about two years ago. “We’re in the process and they wanted to stay in the neighborand dryers and a bathroom downstairs. of building two more communities right hood,” Shultz said. In addition to wanting to inspire people to eat healthier and go outside, Frazier-Coleman said Lehi Valley Trading Company also wants to make itself accessible to customers on whatever “avenue of social media” they prefer. “We’re becoming more digitally focused,” she said. While the challenge raises awareness for Lehi Valley Trading Company, FrazierLehi Trading Company offers its customer-vendors choices in packaging Coleman said it also “drives of their products. (Special to the Tribune) people back into the retailer to purchase product.” Since the start of the challenge, Methe company’s website, consists primarily of “preservatives, artificial flavors, ar- jia said “they’ve had a lot of positive retificial colors, dyes, all of those things the sponses” from people who want to know government and the health care industry” where they can find their products lohave deemed unhealthy for people to con- cally. People who are already consuming the sume, she said. “It’s a standard that a lot of our retail- products can now also see the health beners have put out there for the customer,” efits of doing so, she said. As a result of the challenge, Mejia said Mejia said. While not all of their products are she hopes more individuals see that “Lehi free from every item on the list, Frazier- Valley has wholesome snacks that benefit Coleman said “a lot” of them are and are the mind and body.” In addition to making sure employees marked accordingly. She said items that are gluten-free, high are working in a physically clean and safe in protein, low in cholesterol and contain space, Lewis Freeman said, the company also sees to creating an environment in no trans fats are also listed. THANK YOU FOR VOTING US BEST DENTIST IN THIS YEARS BEST OF MESA! DO YOU HAVE LOWER DENTURES THAT DON’T FIT? MISSING TEETH? TALK TO US ABOUT IMPLANTS! Implants With coupon. Expires 5/31/19. Please bring this coupon at initial visit. Crown, Bridge or Veneers With coupon. Expires 5/31/19. 1837 S. Mesa Drive, Suite A-201, Mesa, AZ 85210 1837 S. Mesa Drive, Suite A-201, Mesa, Schedule your appointment today!AZ 85210 Schedule your appointment today! Implants With coupon. Expires 4/30/19. OFF $ Crown, Bridge 149 or Veneers With coupon. Expires 4/30/19. of two things when the lunch check arrives – deliver a dissertation on the 1938 federal Fair Labor Standards Act and subminimum wages or simply leave a single crumpled dollar bill on the table – I feel duty bound to offer to pay for lunch. Sometimes, BTG loudly insists that it’s his turn to buy. Him winning that argument means I have to lag behind as we leave the restaurant, usually by lying about needing to use the restroom. Then I have to double back to our table and add enough cash to his buck to get us to a 20 percent tip, minimum. Why go to all that trouble? Partially it’s my fear of bad karma. But mostly it’s the years I spent waiting tables for more Bad Tipper Guys and Gals than I care to remember. I earned $2.13 an hour in those days and was obligated to “tip out” a percentage of each check to the host staff and busboys. If a diner stiffed me or left behind a buck, that meant I actually paid for the privilege of waiting on their table. A quarter century later, I still go out of my way to tip well, even though I strongly dislike the concept – and the way “tip creep” seems to be impacting more areas of society. Nowadays, there’s a tip jar on every counter: the bakery, the ice cream shop, the pet groomer, the car wash. That often leads to customers standing register-side, 53 cents in hand, waiting for the barista to return for the ceremonial dropping of the coins. Because if a tip falls in a Starbucks and no employee sees it or hears it jingle, was it really a tip at all? Then there’s the newfound popularity of Square, the app that allows anyone with a dongle and an iPad to take credit cards. Each Square transaction comes with a gratuity opportunity and suggested amounts – no tip, 15%, 20%, 25% – helpfully pre-calculated. Talk about a chance to feel like a grinch. Now I find myself tipping people for labor-intensive acts like handing over an empty self-serve coffee cup or stuffing a wienie in a hot dog bun. The latest weird tip request? As of Jan. 1, cheapo airline Frontier has started encouraging tips for flight attendants who sell travelers a pre-packaged sandwich or a can of soda. What’s next? Maybe a dental hygienist with a tip jar next to the tool tray. Or it’ll become customary to start slipping the minister a folded twenty after a particularly moving eulogy. Or, better yet, maybe we will move away from the gratuity model and instead pay people what they’re worth – even if that means a price hike. I’d rather hear Bad Tipper Guy complain about paying an extra two bucks for his stromboli than listen to him whine one more time about how tipping encourages indentured servitude in 21st century America. tick in 23 percent more calls and texts for support from our teens. While the finality of prom, graduation and “becoming an adult” sounds fun, for many it marks the end of a journey, and an unknown step to a new beginning. State testing, final exams and the loss of connection to friends can also provoke feelings of anxiety as summer looms. As a consultant to schools and nonprofit agencies, I travel regionally and nationally almost weekly. There is not a zip code that I have visited that is not facing this crisis. Last week, a young man at one of my presentations in Lake Havasu City waited until the very last question was asked and then stood up asking where the administration was from his high school? How had he been encouraged to come to share solutions to stop the mental health crisis yet the adults had not? The room was eerily silent as the adults looked to each other with no response for this young man. We have to show up, stand up and speak up to save lives. A coalition of thoughtful and civicminded children as part of Arizona March For Our Lives have drafted with bipartisan support a Student Bill of Rights as part of HB 295. School districts would be required to create a school-safety plan, which would outline how each school will respond to students in mental-health crises. It would also mandate that schools develop partnerships with outside community organizations or agencies that students can be referred to when counselors cannot provide long-term care. The alarm has been sounding in the Valley of the Sun for a while, specifically in the zip codes through which we in the East Valley drive. A verse in a song written by Joseph Malins and performed by John Denver says: “Let us stop at its source all this hurt,” cried he. Come, neighbors and friends, let us rally. If the cliff we will fence, we might almost dispense With the ambulance down in the valley. Mayors are mobilizing, Superintendents are acting. Church leaders are calling for prayers of immediate healing. Kids are asking for help. The building of the fence is long overdue. As we enter May, Mental Health Awareness month, I hope you will join forces with me in your own communities by building a sturdy fence of prevention resources to protect our most important assets so there won’t be a need for ambulances or 14-year-old funerals. Arizona Teen Lifeline phone or text: 602-248-8336. - Katie McPherson is an East Valley educator and advocate for improved mental and emotional support for young people. Don’t wait. You may be eligible to enroll now. To learn more, attend a seminar, schedule an in-home visit or enroll now, call 1-855-707-7156 (TTY 711) 7 days a week, 8 a.m. to 8 p.m. Or, visit CignaMedicare.com anytime. gressed thus far for Mountain View, winning a state title isn’t out of the question. returning players. “We know that if we play well we can play with anybody in the state and beat anybody,” Thiel said. “But to do that, you have to play well. If you don’t play well, you’re going to get beat. We are confident and know Mountain View senior infielder that if we do Cam Jowaiszas has become a leadwhat we are er both on the field and in the dugout for the Toros this season. (Zach supposed to Alvira/Tribune Staff) do, we have a good chance to be successful.” Mountain View has no plans to slow down as the end of the regular season nears. The team remains confident, yet humble. And even through the success, they remain focused on the ultimate goal: Being crowned 6A state champions. ou Are Not Alone,” a new fulllength spring production, draws upon experiences from its dancers and artistic director Bridgette Borzillo to create an emotionally charged show with themes high school students often experience. “I have been working in high schools for about three years now and I cannot believe how much it has changed due to cell-phone use, social media and the rise in teen suicide,” Borzillo said, adding: “My hope is that this show will create dialogue between parents, teens and everyone in between to let them know that they are not alone in their emotions and experiences, that all we need to do is look up, reach out and know that there are many people that care.” “You Are Not Alone,” performed by the CaZo Dance Company, premieres at 7:30 p.m. April 19 and at 2 p.m. and 7:30 p.m.
Obituaries Emma Jean Montgomery June 24, 1928 – April 3, 2019 Emma “Jean” Montgomery, 90, beloved wife, mother of two, grandmother to two, and greatgrandmother to five, passed away from pulmonary failure brought on by pneumonia on April 3, 2019 in Mesa, Arizona. She had been living with her daughter in Mesa since May of 2017. She was greatly loved by all who knew her as a sweet, kind, fun, and loving person. She and her husband, Monte “Joe” Montgomery, were both born and raised in Oklahoma, but moved out to California after his discharge from the Army Air Corps in 1947. They remained in California for 56 years. But in 2003, they moved to the Las Palmas mobile home resort in Mesa, AZ, to be closer to their daughter, who lived in nearby Gilbert. While there, they became members of the Velda Rose United Methodist Church, and the local VFW chapter. Joe also purchased season tickets every year for the SF Giants’ spring training games in Scottsdale, which they thoroughly enjoyed. In 2007, they were joined by their daughter in a move out to the Atlanta, GA area to be closer to their son, Stephen, and his family. In 2013, Marilyn purchased a retirement/vacation home in The Wells mobile home community in Mesa, AZ, and in 2017, at the age of 88, Jean and her daughter decided to return to Mesa, AZ permanently so that she could enjoy warm weather, the spring training games, her old friends, community potlucks, and bingo “to her heart’s content”. The world is a much darker place without her. A memorial service and reception will be held at the Apache Wells Community Church to celebrate her life on April 12, 2019 at 2115 N. Gayridge Rd, Mesa, AZ, 85215 starting at 2:00 pm. A second service and reception will follow approximately two weeks later at the Buford First United Methodist Church at 285 E Main St. NE, in Buford, GA 30518. Following that service, her ashes will be interred at Broadlawn Memorial Gardens, 5979 New Bethany Rd, Buford, GA, next to Joe’s. Obituaries Emma Jean Montgomery June 24, 1928 – April 3, 2019 Emma “Jean” Montgomery, 90, beloved wife, mother of two, grandmother to two, and great-grandmother to five, passed away from pulmonary failure brought on by pneumonia on April 3, 2019 in Mesa, Arizona. She had been living with her daughter in Mesa since May of 2017. She was greatly loved by all who knew her as a sweet, kind, fun, and loving person. She and her husband, Monte “Joe” Montgomery, were both born and raised in Oklahoma, but moved out to California after his discharge from the Army Air Corps in 1947. They remained in California for 56 years. But in 2003, they moved to the Las Palmas mobile home resort in Mesa, AZ, to be closer to their daughter, who lived in nearby Gilbert. While there, they became members of the Velda Rose United Methodist Church, and the local VFW chapter. Joe also purchased season tickets every year for the SF Giants’ spring training games in Scottsdale, which they thoroughly enjoyed. In 2007, they were joined by their daughter in a move out to the Atlanta, GA area to be closer to their son, Stephen, and his family. In 2013, Marilyn purchased a retirement/vacation home in The Wells mobile home community in Mesa, AZ, and in 2017, at the age of 88, Jean and her daughter decided to return to Mesa, AZ permanently so that she could enjoy warm weather, the spring training games, her old friends, community potlucks, and bingo “to her heart’s content”. The world is a much darker place without her. A memorial service and reception will be held at the Apache Wells Community Church to celebrate her life on April 12, 2019 at 2115 N. Gayridge Rd, Mesa, AZ, 85215 starting at 2:00 pm. A second service and reception will follow approximately two weeks later at the Buford First United Methodist Church at 285 E Main St. NE, in Buford, GA 30518. Following that service, her ashes will be interred at Broadlawn Memorial Gardens, 5979 New Bethany Rd, Buford, GA, next to Joe’s. Your newspaper. Your community. Your planet. Please recycle me. NOTICE IS HEREBY GIVEN that sealed bids will be received until Thursday, May 2, 2019, until 1:30 p.m. All sealed bids will be received at Mesa City Plaza Building, Engineering Department at 20 East Main Street, 5th Floor, Mesa, Arizona. Please mark the outside of the bid envelope with the name of this bid document. Any bid received after the time specified will be returned without any consideration, except for bids delivered 30 minutes prior to opening which will be received at the information desk, 1st floor, main lobby of the Mesa City Plaza Building. No bid shall be altered, amended or withdrawn after the specified bid due date and time. A non-mandatory Pre-Bid Conference will be held Thursday, April 18th, 2019 at 1:00 p.m. in the upper level Council Chambers at 57 E. First Street, Mesa, Arizona. A pre-bid review of the site has been scheduled. Please refer to Special Provision Section titled ''Pre-Bid Review of Site" for additional information. The site visit is recommended but not mandatory. PHASE II SIGNAL BUTTE IMPROVEMENTS / EASTMARK PARKWAY This contract shall be for furnishing all labor, materials, transportation, and services for the construction and/or installation of all improvements shown on the Plans, including, but not limited to the following: Signal Butte Road Phase 2 (S885) - The Project consists of approximately ¾ of a mile of half street surface improvements to include concrete curb and gutter, sidewalk, box culvert extensions, bridge widening, paving, striping, signage, street lights, street sleeves, landscaping & irrigation. The improvements also consist of storm drain installation to stub west of the Flood Control District of Maricopa County (FCDMC) channel. Box backfill per ADOT. Eastmark Parkway Phase 2 (S893) - The Project consists of approximately 180 linear feet of half street improvements. Improvements include water service relocation, box culvert extension, dry utilities, concrete curb and gutter, sidewalk, paving, signage, sidewalk sleeves, landscaping and irrigation. Box backfill per ADOT. The Engineer’s Estimate Range is $3.0 million to $3.5 million. A Pre-Submittal Conference will be held on April 23, 2019, at 8 am, at the City of Mesa Plaza Building, 20 E. Main Street, Conference Room 501, Mesa, Arizona 85201. At this meeting, City staff will discuss the scope of work and general contract issues and respond to questions from the attendees. Attendance at the pre-submittal conference is not mandatory and all interested firms may submit a Statement of Qualifications whether or not they attend the conference. All interested firms are encouraged to attend the Pre-Submittal Conference since City staff will not be available for meetings or to respond to individual inquiries regarding the project scope outside of this conference. In addition, there will not be meeting minutes or any other information published from the Pre-Submittal Conference. Contact with City Employees. All firms interested in this project (including the firm’s employees, representatives, agents, lobbyists, attorneys, and subconsultants) will refrain, under penalty of disqualification, from direct or indirect contact for the purpose of influencing the selection or creating bias in the selection process with any person who may play a part in the selection process. This policy is intended to create a level playing field for all potential firms, to assure that contract decisions are made in public, and to protect the integrity of the selection process. All contact on this selection process should be addressed to the authorized representative identified above. Contact with City Employees. All firms interested in this project (including the firm’s employees, representatives, agents, lobbyists, attorneys, and subconsultants) will refrain, under penalty of disqualification, from direct or indirect contact for the purpose of influencing the selection or creating bias in the selection process with any person who may play a part in the selection process. This policy is intended to create a level playing field for all potential firms, to assure that contract decisions are made in public, and to protect the integrity of the selection process. All contact on this selection process should be addressed to the authorized representative identified below. Contractors desiring to submit proposals may purchase sets of the Bid Documents from ARC Document Solutions, LLC, at https://order.e-arc.com/arcEOC/PWELL_Main.asp?mem=29. Click on “Go” for the Public Planroom to access plans. NOTE: In order to be placed on the Plan Holders List and to receive notifications and updates regarding this bid (such as addenda) during the bidding period, an order must be placed. The cost of each Bid Set will be no more than $54.00, which is non-refundable regardless of whether the Contractor Documents are returned. Partial bid packages are not sold. You can view documents on-line (at no cost), order Bid Sets, and access the Plan Holders List on the website at the address listed above. Please verify print lead time prior to arriving for pick-up. For a list of locations nearest you, go to www.e-arc.com. RFQ Lists. This RFQ is available on the City’s website at http://mesaaz.gov/business/engineering/architectural-engineering-design-opportunities. One set of the Contract Documents is also available for viewing at the City of Mesa’s Engineering Department at 20 East Main Street, Mesa, AZ. Please call (480) 644-2251 prior to arriving to ensure that the documents are available for viewing. The City of Mesa is seeking a qualified Construction Manager at Risk (CM@Risk) to provide PreConstruction Services and complete Construction Services as the CM@Risk for the Southern Avenue and Stapley Drive Gas and Water Line Replacements Project. All qualified firms that are interested in providing these services are invited to submit their Statements of Qualifications (SOQ) in accordance with the requirements detailed in the Request for Qualifications (RFQ). NOTICE IS HEREBY GIVEN that sealed bids will be received until Thursday, May 2, 2019, at 1 p.m. All sealed bids will be received at Mesa City Plaza Building, Engineering Department at 20 East Main Street, 5th Floor, Mesa, Arizona; except for bids delivered 30 minutes prior to opening which will be received at the information desk, 1st floor, Main Lobby of the Mesa City Plaza Building. Any bid received after the time specified will be returned without any consideration. This contract shall be for furnishing all labor, materials, transportation and services for the construction and/or installation of the following work: Hibbert Streetscape – Within the public right-of-way, provide and install landscaping and irrigation improvements, unit pavers, concrete flatwork for public sidewalk, and benches and bike racks per the project plans. 2nd Ave Streetscape - Within the public right-of-way, provide and install landscaping improvements per the project plans. The following is a summary of the project. The required tasks will be reviewed with the selected CM@Risk and defined to meet the needs of the project as part of the contract scoping. This project consists of various water and gas improvements along Southern Avenue from Horne to Harris Drive and along Stapley Drive from US 60 to 8th Avenue. These improvements include replacement of 5,300 LF of 6” gas pipe and 2000 LF of 2” gas pipe. The work includes all required trenching, valves, services, and other required appurtenances. Only those Contractors on the City of Mesa Approved Gas Line Contractors List shall perform on the City of Mesa gas system. The estimated construction cost is $6,000,000. Hibbert Streetscape = $60,000.00, 2nd Ave Streetscape = $35,000.00, Total = $95,000.00. A Pre-Submittal Conference will be held on April 25, 2019 at 10:00amat the City of Mesa Engineering Department, 20 E. Main Street, Conference Room 501, Mesa AZ 85201.At this meeting, City staff will discuss the scope of work and general contract issues and respond to questions from the attendees. Attendance at the pre-submittal conference is not mandatory and all interested firms may submit a Statement of Qualifications whether or not they attend the conference. All interested firms are encouraged to attend the Pre-Submittal Conference since City staff will not be available for meetings or to respond to individual inquiries regarding the project scope outside of this conference. In addition, there will not be meeting minutes or any other information published from the Pre-Submittal Conference. For all technical, contract, bid-related, or other questions, please contact Donna Horn at donna.horn@mesaaz.gov. Contact with City Employees. All firms interested in this project (including the firm’s employees, representatives, agents, lobbyists, attorneys, and subconsultants) will refrain, under penalty of disqualification, from direct or indirect contact for the purpose of influencing the selection or creating bias in the selection process with any person who may play a part in the selection process. This policy is intended to create a level playing field for all potential firms, to assure that contract decisions are made in public, and to protect the integrity of the selection process. All contact on this selection process should be addressed to the authorized representative identified above. Contractors desiring to submit proposals may purchase sets of the Bid Documents from ARC Document Solutions, LLC, at https://order.e-arc.com/arcEOC/PWELL_Main.asp?mem=29. Click on “Go” for the Public Planroom to access plans. NOTE: In order to be placed on the Plan Holders List and to receive notifications and updates regarding this bid (such as addenda) during the bidding period, an order must be placed. The cost of each Bid Set will be no more than $20, which is non-refundable. Partial bid packages are not sold. You can view documents on-line (at no cost), order Bid Sets, and access the Plan Holders List on the website at the address listed above. Please verify print lead time prior to arriving for pick-up. For a list of locations nearest you, go to www.earc.com. One set of the Contract Documents is also available for viewing at the City of Mesa’s Engineering Department at 20 East Main Street, Mesa, AZ. Please call 480-644-2251 prior to arriving to ensure that the documents are available for viewing. RFQ Lists. The RFQ is available on the City’s website at http://mesaaz.gov/business/engineering/construction-manager-at-risk-and-job-order-contractingopportunities. [Body Donation Program] You Can Make a Difference for the Future of Healthcare. Gannett Publishing Services (GPS) wants to contract you to deliver newspaper and magazine products in the early morning hours in the Phoenix metro area. Routes available now in your area (East Valley, West Valley, North Phoenix). Earn an extra $180-$300 per week. Work just 2-3 hours a day between 12:00AM – 6:00AM. Current driver's license, insurance and access to a vehicle are required. Must include zip code when applying. Visit deliveryopportunities.gannett.com or call 602-444-4243. Make your choice Everlasting Need help writing an obituary? We have articles that will help guide you through the process. Deadline for obituaries is Wednesday at 5pm for Sunday. All obituaries will be approved by our staff prior to being activated. Be aware there may be early deadlines around holidays. 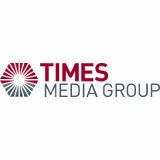 Business Development Specialist - FT - Tempe Times Media Group has an immediate fulltime opening for a Business Development Specialist. The successful candidate will be responsible for developing new business for targeted specialty publications. Primary responsibilities include strategic prospecting, sales acquisition via the phone, account retention and must be able to work collaboratively with clients and internal staff. Top candidate will possess excellent communication skills, phone presence, and enthusiasm, be able to meet critical deadlines, have a positive, professional attitude and the ability to work as part of a fun team. Entry level data processing position available in NE Mesa medical billing office. Benefits available. Send resume to mjp@medstataz.com. Chef, Chinese Specialty Food, ft, req. 2 yrs experience Apply at JPMEI LLC Jade Palace Chinese Cuisine 8876 E. Pinnacle Peak Road, #104, Scottsdale, AZ 85255 CONCRETE FINISHERS NEEDED IMMEDIATE OPENINGS for work throughout Maricopa County. Must have a valid driver's license, own transportation and be able to bend and lift. We are looking for highly motivated individuals that enjoy teamwork. On the job training, paid time off with a competitive rate. Please email resume to MDMerrett@aol.com or give us a call at (480) 575-0915. OUR JOB BOARD HAS THE TALENT YOU’RE LOOKING FOR. Gilbert: Seville Golf & Country Club Huge Community Wide Garage Sale btwn Riggs/ N & S. of Chandler Heights. W. of Power & E. & W. of Higley. Sat April. 13th & Sun the 14th 8am-? AC-HEAT-PLUMBING FREE ESTIMATES! FREE DIAGNOSIS! Carpet Cleaning Best Cleaning You Will Ever Have! ASK US HOW YOUR $105,000 CASH INVESTMENT AND OUR SENIOR LOAN PROGRAM ENABLES QUALIFIED 62+ SENIORS MAKING THE LINKS THEIR PRIMARY RESIDENCE HAVE NO MORTGAGE PAYMENT & NO LOT RENT AS LONG AS YOU LIVE IN HOME. Call us to place your ad online! allstarcleaning3@gmail.com The All Stars of Cleaning! House Painting, Drywall, Reliable, Dependable, Honest! 480.266.4589 josedominguez0224@gmail.com Not a licensed contractor. 480-720-3840 Not a licensed contractor. We Beat Competitors Prices & Quality Free Estimates! Home of the 10-Year Warranty! Free Estimates with Pride & Prompt Service! Includes in & out up to 30 Panes Sun Screens Cleaned $3 each Attention to detail and tidy in your home.